Profoundly Seth: Bugs, Reading, and a high school self portrait. A mash up. Bugs, Reading, and a high school self portrait. A mash up. My son amazes me. He just came trotting out of his bedroom, balancing a smashed cockroach atop the book he totally murdered it with. The kid never even called out or said there was a bug...he just took care of business, then came and tossed it outside. That's what I'm talking about. Amazing child. I almost took a picture to post here, but them I realized that as proud as I was, it was still pretty gross, so I spared you all. Ava has a book report due this week so she came to Panera with me tonight while the kids' dad visited. She was pretty darn adorable. She sat and read while I did some prep for finals and she was just so serious about it all...she's growing up so fast. I have to say I have been really impressed with her reading. She just turned six in Ausgust and while I'm sure there are lots of kids out there who read more fluently than she does, she has really been imporoving lately. She asked me to video her "for the dot com. ", which is what she calls the blog, which cracks me up every single time. So here is a video of Ava reading her book report book. The end is the most precious part...she looks so proud of herself! I would like to start a grassroots movement to get schools to cancel all classes between Thanksgiving and Christmas. Just let the kids out the day before Thanksgiving, and we'll see you after New Year's. I am having the hardest time focusing on the kids' work, not to mention my own, in this weird two and a half week period between the holidays! Anyone else? Last night I was chatting on facebook with an old friend from high school, and he asked me how I've managed to get prettier since high school. After I laughed out loud (literally) for about fifteen minutes, I told him that he must be looking at really flattering pictures, and it didn't help that I was painfully gangly and awkward in high school, as he should know. Therefore, it really wouldn't take much to look better these days. He didn't buy my explanation and said I had memory problems, which kind of cracked me up. It's funny how you can remember things so vividly and yet so differently from someone else. My best friend from high school and I have always had very different ideas of how high school went down, and I always assumed I was right and she was crazy, but apparently I may have to consider that my own experiences may have been colored a bit by how awkward I felt on the inside, whether or not I looked that way on the outside. However, I am still maintaining I did look painfully gangly. And awkward. And that's just how it is. I was hanging onto Lindsey just to keep from falling over. I couldn't even stand on my own feet. My limbs were not under control in any way. 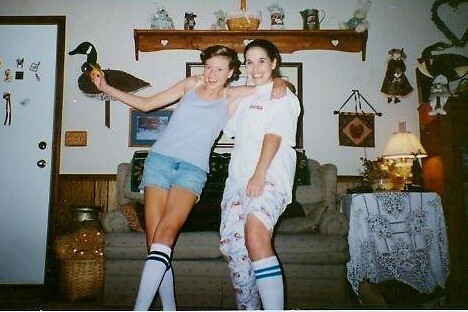 But I did know how to rock a knee sock even then. And let's not even get into the fact that our after prom festivities consisted of donning said knee socks and eating lots of snacks. And considering then shooting down playing spin the bottle. Because it was just a little too out there for us. If you couldn't tell, my friends and I were the rule breakers in high school. We left no movie unwatched, no trivia game unplayed, no comment unanalyzed. You guys have seen the JELKS notebook. We were ridiculous. We were incredible dorks. And we liked it that way.